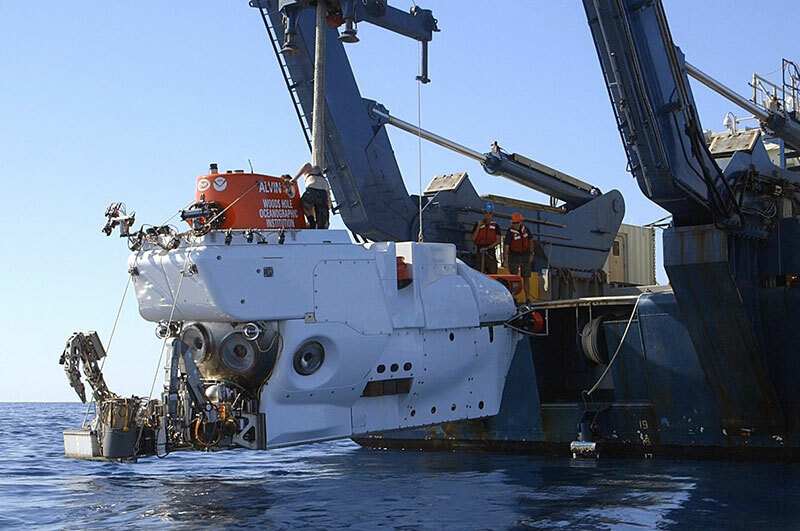 Alvin, which is operated by Woods Hole Oceanographic Institution, has been in operation since 1964. The human occupied vehicle is capable of reaching depths of 4,500 meters, carrying two scientists and one pilot for each dive. Image courtesy of Luis Lamar, Woods Hole Oceanographic Institution. Download larger version (jpg, 476 KB). 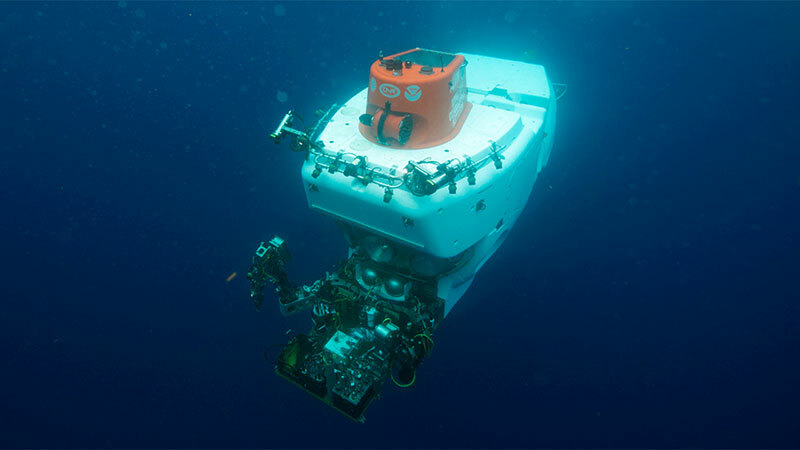 The human-occupied vehicle (HOV) Alvin enables direct data collection and observation by two scientists of the seafloor and water column to depths reaching 2.8 miles (4,500 meters) on dives lasting up to 10 hours with the support of an experienced, multi-talented support team. The Alvin Group and their equipment meet the highest safety and reliability standards as a result of decades of operational and engineering expertise. Continual innovation and the application of the latest technological advancements puts Alvin at the forefront of expeditionary research. Its seven reversible thrusters permit Alvin to hover in the water, maneuver over rugged topography, or rest on the seafloor. With an experienced pilot at the controls, it can collect data throughout the water column, produce a variety of maps, and perform photographic surveys. 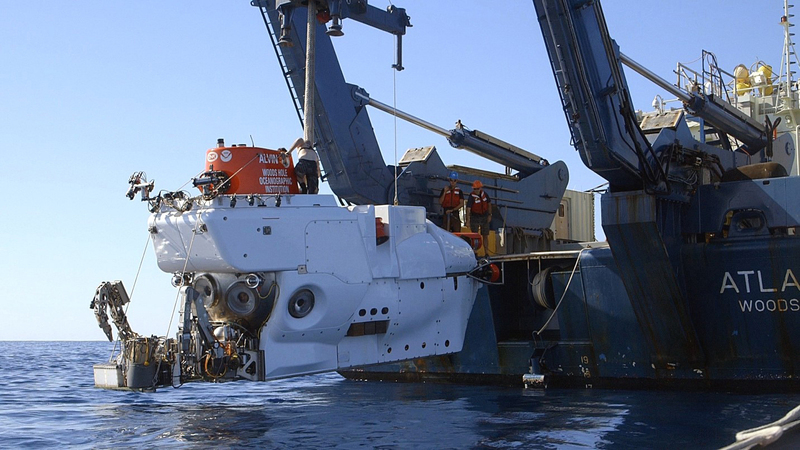 Alvin also has two robotic arms that can manipulate instruments and obtain samples ranging from hard-rock geology to delicate biology, and its sampling basket can be reconfigured daily based on the needs of each dive. Alvin is a proven and reliable platform capable of diving for up to 30 days in a row before requiring a scheduled maintenance day. Recent collaborations with autonomous vehicles such as Sentry have proven expansive, allowing research teams to visit promising sites to collect samples and data in-person within hours of being discovered, and University-National Oceanographic Laboratory System (UNOLS)-driven technological advances have improved the ability for scientific outreach and collaboration via telepresence. 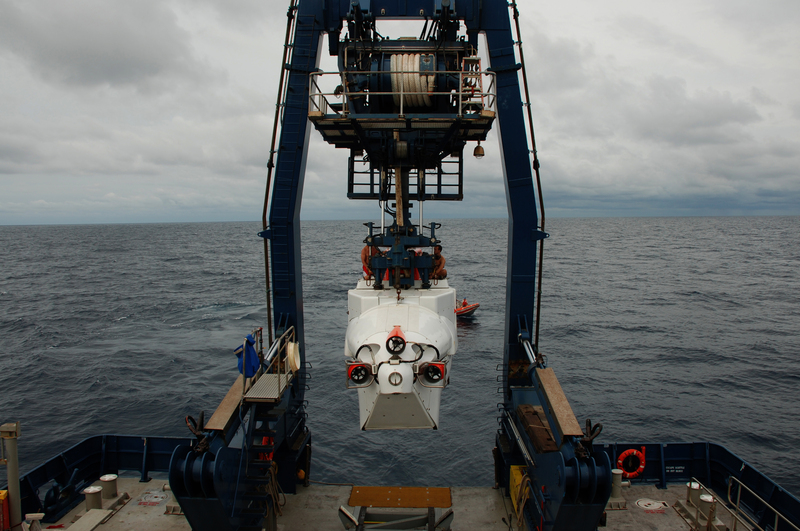 Currently rated to 4,500 meters, Alvin gives researchers in-person access to about two-thirds of the ocean floor. The sub’s most recent upgrade, completed in 2014, increased the depth rating of many of the vehicle’s systems, putting it just steps away from having a depth rating of 4.04 miles (6,500 meters) that would provide access to approximately 98 percent of the seafloor. HOV Alvin was affectionately named after Woods Hole Oceanographic Institution (WHOI) engineer Allyn Vine, whose influence was pivotal in Alvin’s conception. A legendary figure at WHOI, Vine first envisioned a deep-sea research vessel in the 1930s when he was a graduate student in physics. Swimmers Todd Litke and Drew Bewley sit atop Alvin as its lowered from the A-frame into the water. Once in the water, the swimmers are responsible for disconnecting the lines and communicating with the pilot inside to ensure that the sub is ready for descent. Image courtesy of DEEP SEARCH 2018 - BOEM, USGS, NOAA. Download larger version (jpg, 4.4 MB). Launching Alvin into the sea; note the sampling basket at the forward part of the sub with all of the sampling equipment attached. Image courtesy of Acid Horizon (2018). Download larger version (jpg, 654 KB).